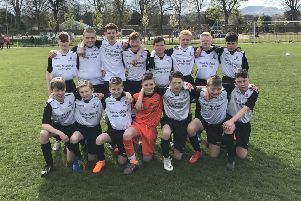 Broxburn Athletic Colts 19s coach Darren Pegg is confident his side can lift the Scottish Cup in the club’s first-ever appearance in the competition’s final. Athletic travel to Airdrie’s Excelsior Stadium to face Renfrewshire side East End United BC 19s on Sunday and Pegg wants to see his side mark the club’s 40th anniversary by bringing the trophy back to West Lothian. “I’m feeling optimistic,” said Pegg. “We’ve got a group of players that can win on any occasion. If we play as well as we can we should win. I’ve got a great team here so we never fear anyone. It wasn’t a straightforward run to the final for the boys in red and white, however. Along the way they had to beat last year’s 17s Scottish Cup winners Antonine Blacks in the quarter-finals. Having negotiated that they then faced Tynecastle 19s in the semi-finals at St Mark’s Park where they saw off a relentless onslaught from their opponents in the second half to win 2-1.